Just getting started with lead nurturing? Recently invested in marketing automation software? Concerned that your lead nurturing program isn’t everything it should be? Inside, you’ll discover the secrets to success and core lead management principles that can increase response rates, convert more leads to opportunities, and accelerate the ROI from marketing automation software. Download your copy of the white paper here. For more information on the summit and to register, click here. Following the presentation at 1:30 PM PST, I’ll also be available online for live Q&A. UPDATE: all sessions from the June 29 event are now available on-demand by following the same link. This entry was posted in B2B Marketing, Database Marketing, Demand Generation, Lead Management, Lead Nurturing, Marketing Automation and tagged b2b demand generation, b2b lead generation, B2B Marketing, Lead Management, Lead Nurturing, Marketing Automation on June 11, 2010 by Howard Sewell. 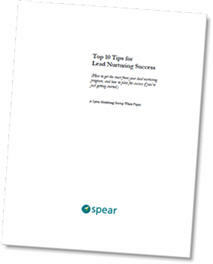 Just wanted you to know that I think your white paper is a fantastic resource for B2B marketers! Not only do you provide 10 solid tips, but you share great examples and ideas to show marketers how to approach each one effectively.